This building is sometimes referred to as a Baptist Chapel, in the 1881 edition of Kelly’s Directory it is listed as the Brixton Tabernacle. It stood on the corner of where Hackford Road and Russell Street met, there currently stands a row of modern houses on this site. Brixton Tabernacle was built in 1871 and remained on the site until 1884 when the church moved to the far larger chapel where the skate board park now stands. 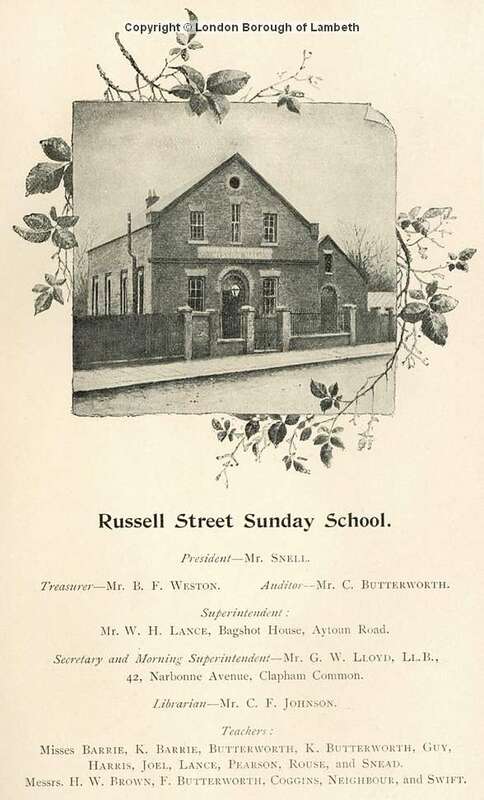 That building was designed by the pastor, Charles Cornwell – who had actually taken the opening services of this building. Since 1975 the church has met in the hexagonal building opposite that site in Stockwell Road. In 1884 this building was sold to Russell Street Independent Mission Hall – you can just make out the wording on the accompanying photo. The smaller building beside the main chapel was opened for our Sunday school in 1874. The Sunday School still meets every Sunday afternoon. Mr Cornwell claims to have published the first ever Baptist Sunday school Hymn Book.